Shop Fishman Amplifier Cover for Loudbox Mini from AMS and enjoy Fast & Free Shipping. 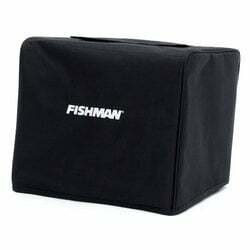 The Fishman amplifier cover for Loudbox Mini is a durable, great quality cover made to preserve your Loudbox Mini amp’s condition and value. A Velcro strip is provided to keep the dust out when not in use. A handsome embroidered Fishman logo, and piping around the seams for a more solid appearance and added durability. Custom fitted nylon slip cover featuring an opening for the amp handle so it's easy to carry. Whether you have just purchased a Loudbox Mini amp, or want to maintain the condition of one you have owned for years, the Fishman amplifier cover for Loudbox Mini is the best investment for preventing future wear and tear. Well made and it fits great ! Fits perfect. Helps protect the unit in travel. Very nice cover. Durable and looks great. it should have come with the purchase of the amp.